Family & Living How to choose affordable Wedding dresses online? How to choose affordable Wedding dresses online? Marriage is a special occasion in our life which we all thrive to make it a memorable event. At the same time we need to plan carefully to keep the wedding budget under control. Wedding dresses are one of the centre of attraction in a marriage, it’s important to choose the right outfit at affordable price as it has significant portion in the wedding budget. There are many occasions I have seen that brides and their family are struggling to choose the right wedding gown within the budget. The shopping for wedding starts a month before and they go shop by shop to buy the dresses and accessories. This is time consuming task, hence it is important to have adequate knowledge to make right purchase decision. One of my cousin marriage planned next month, she has been going around shopping to buy suitable wedding dress for her but couldn’t finalize one. After going around shops in her city, trying multiple collections, nothing she found attractive. I was talking to her last week, she looks tensed as the marriage date nearing and not ordered wedding outfit yet. I told her that there are many options available online than traditional shopping by going shop to shop for buying the wedding dresses. I have shared one of the prominent online wedding shops Amodabridal.com.au and asked her to go through the wedding collections. She got amazed looking at this online wedding dress portal as she can see many designs which she didn’t come across in the physical shops she visited in her city. Apart from the wedding dresses, she found wedding accessories and wedding party dresses for her family in this portal. This website has various options to choose the colour and size before ordering with remarkable discounts. She was extremely happy to see the wedding collections online with amazing discounts. 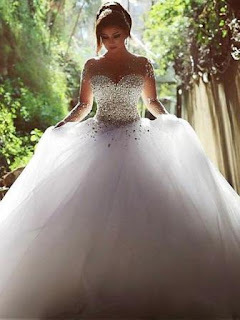 Those who all looking for wedding dresses in Australia and cheap wedding dresses online, this website is the right choice to find their wedding dresses. I had a look at this website, it has the wedding collections under broad categories like wedding dresses, wedding party dresses, formal dresses and wedding accessories. There are plenty of pictures under each category by models wearing the wedding collections. There are options to sort the dresses by Silhouette, Neckline, back details, customer rating, low and high prices. This really helps to sort the handful of collections which meets our requirements. After finalizing the wedding dress among the choices, we can choose the colour, size and read through the detailed specifications before ordering. We can see the tailoring period and shipping time on the ordering page to ensure timely receipt of the product. They have multiple payment option like credit cards, western union and bank transfer to ease buying experience. The good part is they ship all over the World. I can say that buying wedding dress is a huge task as it involves time and cost, but if we plan it carefully we can make it easy and cheap. If we follow simple tips as listed below, it helps to buy the right outfit for the bride to ensure the centre of attraction on the big day. Start the search early, minimum three months in advance from marriage. Read through reliable articles to learn about wedding collections, materials, and designs. Consult with friends and relatives for suggestions. Plan a realistic budget considering all the options. Don’t carry away with latest fashion, how it fits you matters. Visualize yourself how you want to be seen on the marriage day. Finally, choose the right shopping partner to buy your outfit. I believe this post gives you a fair idea about wedding dress purchase experience and the simple tips to follow while preparing for wedding dress shopping. Always keep it simple, give time and search through various options to get the best collections at affordable prices. I eloped my first wedding....it was a hippie one too so my clothes were super cheap from a used clothing store in Boston. Second one I wore a purple velvet 'Hogwarts' dress. Weddings are crazy expensive...I'd rather spend the money on a great vacation. I love weddings! It was a pleasure just visiting and reading your helpful tips and viewing the gorgeous dresses. I'm SO glad my wedding days are over. That whole thing was exhausting. And no matter what dress you pick, 20 years down the road when styles are different, your pictures will look dated! Helpful! The dress is so special for the bride. Interesting, not for me, I don't wear dresses!